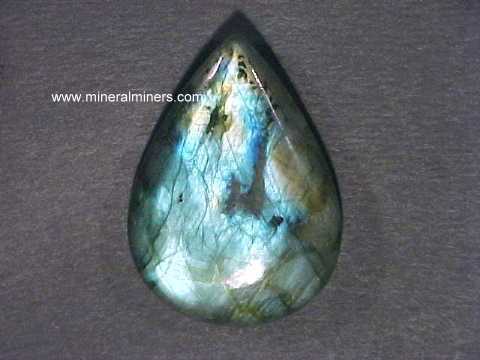 Try our Labradorite Satisfaction Guarantee - compare our prices and our superior quality. 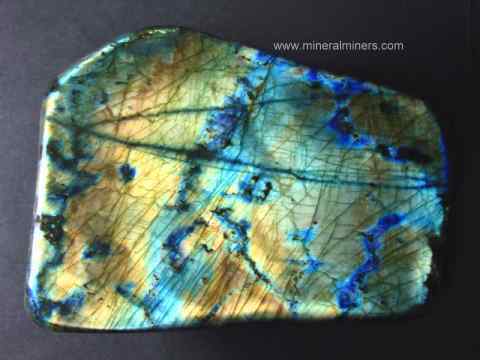 Click on any genuine labradorite image below to enlarge it. This beautiful labradorite pendant was hand-crafted in sterling silver and set with two larger oval shaped cabochon gems of natural labradorite measuring 14x10mm and 11x9mm, and with a smaller 7x5mm faceted gem of natural labradorite at the bottom. 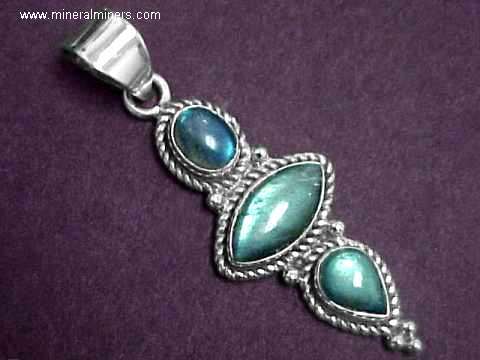 The wonderful gems in this genuine labradorite jewelry design have rich blue and green flashes of iridescent natural color. 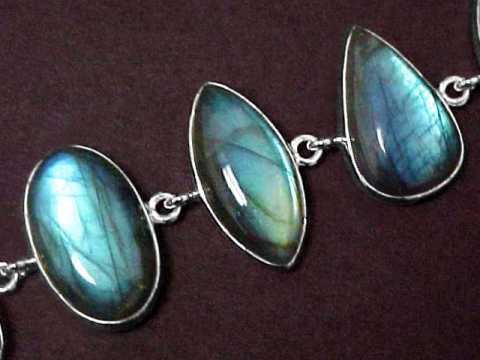 This beautiful labradorite bracelet was hand-crafted in sterling silver and set with seven gemstones of natural labradorite measuring from 16x9mm up to 22x12mm with amazing greenish-blue and golden flashes of natural iridescent color. This natural labradorite bracelet was hand-crafted in sterling silver and set with seven beautiful cabochon gemstones of natural labradorite with rich greenish-blue and golden flashes of natural iridescent color. These seven genuine labradorite gemstones measure from 15x10mm up to 20x11mm in size. This large labradorite bracelet was hand-crafted in sterling silver and set with five large size beautiful cabochon gems of natural labradorite with rich green, gold and blue flashes of natural iridescent color. These five genuine labradorite gemstones measure from 25x14mm up to 30x21mm in size. See also a full view of this natural labradorite bracelet. This natural labradorite bracelet was hand-crafted in sterling silver and set with six large size beautiful cabochon gems of natural labradorite with rich green, gold and blue flashes of natural iridescent color. These six genuine labradorite gemstones measure from 24x15mm up to 26x15mm in size. 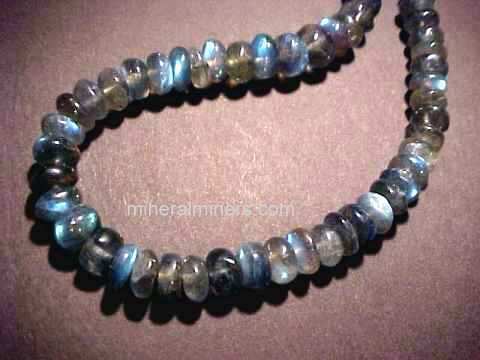 See also a full view of this genuine labradorite bracelet. Labradorite Specimen Dimensions: 4.5" x 3.8" x 1.4"
This superior quality specimen of natural color labradorite feldspar (also known as spectrolite) has large colorful areas of fine jewelry quality on its front surface. It has been roughly hand-ground and polished on all surfaces to better show its rich "color-play" (also known as labradorescence or schiller) that flashes out at different angles as you turn it in shades of orange, blue, gold and green, with a small amount of purple. 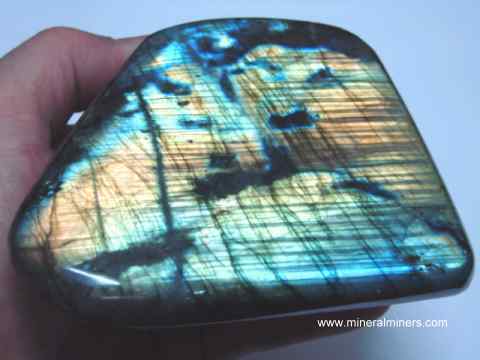 See also another view this polished labradorite specimen showing the same surface turned just slightly. Polished Labradorite Dimensions: 4.8" x 2.7" x 2.0"
This unique specimen of natural color labradorite feldspar (also known as spectrolite) shows many different colors on its front surface. This labradorite specimen has been roughly hand-ground and then hand-polished to better show its "color-play" (also known as labradorescence or schiller) that flashes out on the front surface at different angles as you turn it. Labradorite Specimen Dimensions: 4" x 3.7" x 1.9"
This beautiful specimen of natural color labradorite feldspar (also known as spectrolite) has large colorful areas of jewelry grade on its front surface. It has been roughly hand-ground and polished on all surfaces to better show its rich "color-play" (also known as labradorescence or schiller) that flashes out at different angles as you turn it in shades of blue, green, and gold. Polished Labradorite Dimensions: 6.7" x 3.1" x 2.4"
This superior quality specimen of natural color labradorite feldspar (also known as spectrolite) has large colorful areas of fine jewelry quality on its front and back surfaces. It has been roughly hand-ground and polished on all surfaces to better show its rich "color-play" (also known as labradorescence or schiller) that flashes out at different angles as you turn it in shades of golden-orange, blue and green. Polished Labradorite Dimensions: 4.7" x 3.9" x 1.8"
This unique specimen of natural color labradorite feldspar (also known as spectrolite) shows blue, green, gold, and orange colors on its front and back surfaces. 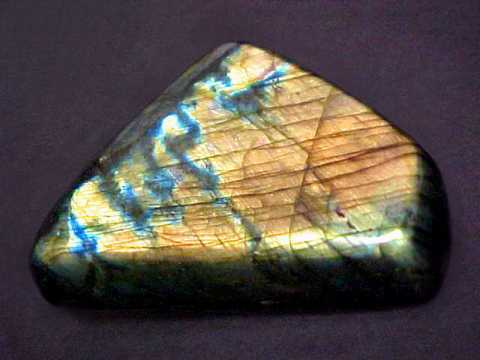 This labradorite specimen has been roughly hand-ground and then hand-polished to better show its "color-play" (also known as labradorescence or schiller) that flashes out at different angles as you turn it. Polished Labradorite Dimensions: 6.8" x 3.9" x 1.6"
This unique specimen of natural color labradorite feldspar (also known as spectrolite) shows blue, green, and golden colors on its front and back surfaces. 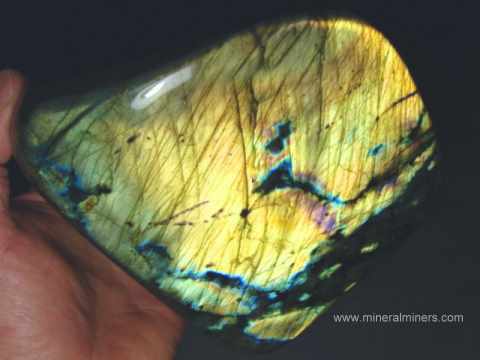 This labradorite specimen has been roughly hand-ground and then hand-polished to better show its "color-play" (also known as labradorescence or schiller) that flashes out at different angles as you turn it. Polished Labradorite Dimensions: 5.6" x 3.2" x 2.3"
This unique specimen of natural color labradorite feldspar (also known as spectrolite) has large colorful areas of jewelry quality on its front surface. 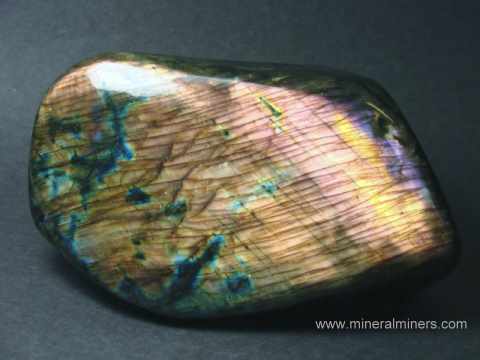 This labradorite specimen has been roughly hand-ground and then hand-polished to better show its "color-play" (also known as labradorescence or schiller) that flashes out at different angles as you turn it. This labradorite has golden color on the left and greenish color on the right with some small blue and pink areas! Labradorite Specimen Dimensions: 6.1" x 3.6" x 3.4"
This beautiful specimen of natural color labradorite feldspar (also known as spectrolite) has large colorful areas of jewelry grade on its front surface. It has been roughly hand-ground and polished on all surfaces to better show its rich "color-play" (also known as labradorescence or schiller) that flashes out at different angles as you turn it with purple colors at one edge grading into pink and gold with some blue. This genuine labradorite specimen measures 6.3" x 3.3" x 3.1"
This unique specimen of natural color labradorite feldspar (also known as spectrolite) has large colorful areas of jewelry quality on its front surface. It has been roughly hand-ground and polished on all surfaces. Its front surface shows natural golden green "color-play" (also known as labradorescence or schiller). Polished Labradorite Dimensions: 6.3" x 5" x 2.6"
This unique specimen of natural color labradorite feldspar (also known as spectrolite) shows very beautiful blue-green colors on its front and back surfaces. This labradorite decorator specimen has been roughly hand-ground and then hand-polished to better show its "color-play" (also known as labradorescence or schiller) that flashes out on the front surface at different angles as you turn it. Labradorite Specimen Dimensions: 10" tall x 7" x 4.2"
This beautiful specimen of natural color labradorite feldspar (also known as spectrolite) has large colorful areas of jewelry grade on its front surface. It has been roughly hand-ground and polished on all surfaces to better show its rich "color-play" (also known as labradorescence or schiller) that flashes out at different angles as you turn it with gold, green and blue colors. Polished Labradorite Dimensions: 9.5" x 7.6" x 4.4"
This wonderful decorator specimen of natural color labradorite feldspar (also known as spectrolite) has large colorful areas of fine jewelry quality on its front surface. It has been roughly hand-ground and polished on all surfaces to better show its green, gold and blue "color-play" (also known as labradorescence or schiller) that flashes out at different angles as you turn it. Labradorite Dimensions: 13.2" x 8.4" x 3.7"
This extra large size decorator specimen of natural color labradorite feldspar (also known as spectrolite) has large colorful areas of fine jewelry quality on its front surface. This rare quality labradorite specimen has been roughly hand-ground and polished on all surfaces to better show its green, gold and blue "color-play" (also known as labradorescence or schiller) that flashes out at different angles as you turn it. 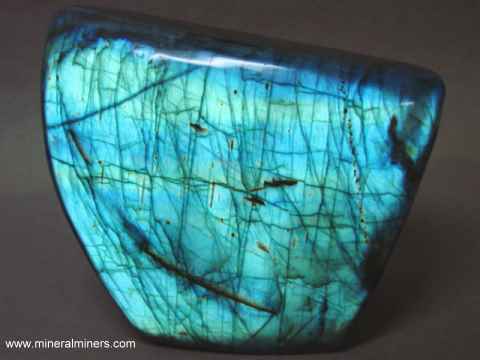 Natural Labradorite Specimen weighs 44.6 Lbs! Labradorite Dimensions: 13.5" x 12" x 6"
This large size decorator specimen of natural color labradorite feldspar (also known as spectrolite) has large colorful areas on its front surface. This large labradorite decorator specimen has been roughly hand-ground and polished on all surfaces to better show its green, gold and blue "color-play" (also known as labradorescence or schiller) that flashes out at different angles. This 3.7 inch labradorite sphere was hand-ground & polished from natural labradorite rough that was mined in Madagascar. It shows a beautiful "play of colors" (also known as schiller or labradorescence) in gold, green and blue flashes of color on some areas of its surface. Our Labradorites are all natural color untreated labradorite! We also offer several other feldspar varieties several other feldspar varieties including moonstone, sunstone and amazonite and albite. 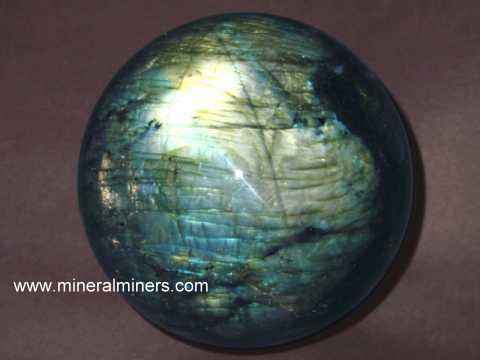 Please see the links below for natural labradorite products including labradorite spheres, mineral specimens and lapidary grade polished labradorite pieces! 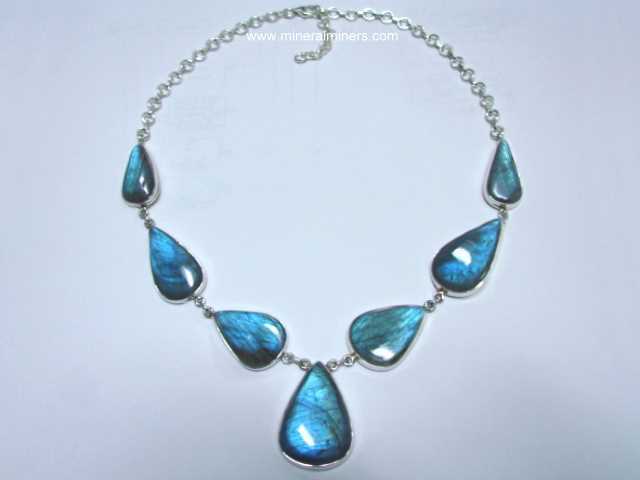 See also our page displaying genuine Labradorite Jewelry items. 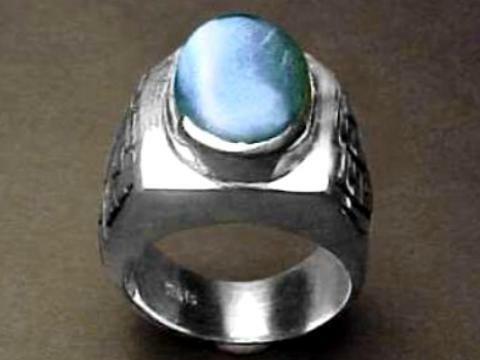 Would you like us to inform you when we add on this page more superior quality labradorite polished pieces? We do have additional inventory of high quality labradorite items in stock, so be sure to let us know if you have any special requests for genuine labradorite items of superior quality.